Citation Information: J Clin Invest. 2007;117(4):865-868. https://doi.org/10.1172/JCI31861. A model for CDX2-mediated leukemogenesis. CDX2 is expressed in the posterior primitive streak during embryogenesis, where it directs anteroposterior axial development and elongation by regulating HOX gene expression. 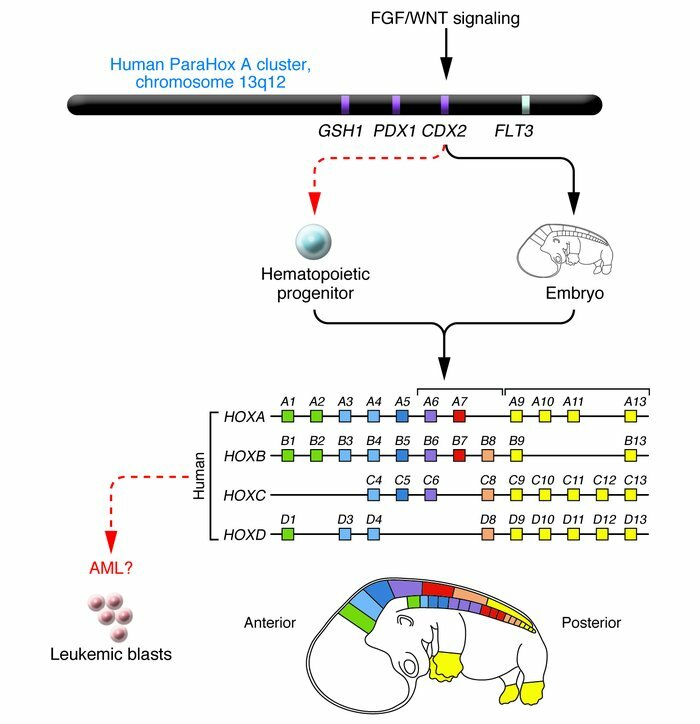 A study in this issue of the JCI (12) reports that monoallelic expression of CDX2 is observed in 90% of patients with AML and may perturb hematopoiesis by affecting HOX gene expression (red dashed arrows indicate ectopic expression; black arrows indicate normal expression in embryonic development). GSH1, GS homeobox 1; PDX1, pancreatic and duodenal homeobox 1. Figure modified with permission from Molecular Genetics and Metabolism (21).